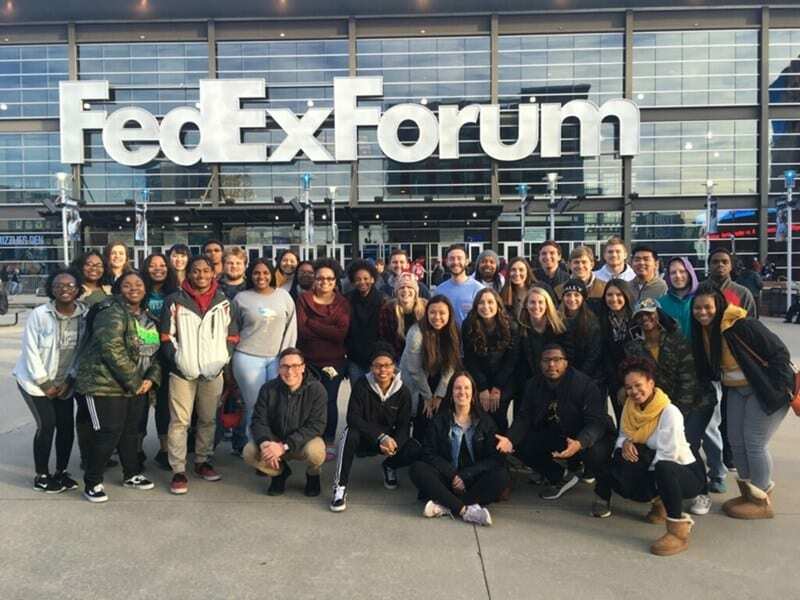 University Recreation students visit Memphis on Martin Luther King Jr. Day, Jan. 21, 2019. Their main stop was the National Civil Rights Museum. University Recreation, in partnership with the University of Arkansas Center for Multicultural and Diversity Education, took 41 students to Memphis, to visit the National Civil Rights Museum on Martin Luther King Jr. Day, Jan. 21, 2019. The National Civil Rights Museum is a complex of museums and historic buildings located in the Tennessee city. Its exhibits, trace the history of the Civil Rights Movement in the United States from the 17th century to present day. Martin Luther King Jr. Day is celebrated every year on the third Monday of January to commemorate King’s birth. He would have celebrated his 90th birthday this year. U of A students visited the museum dedicated to the Civil Rights Movement, as well as the attached site where King’s life was taken at the Lorraine Motel. “Growing up in Alabama, we usually took trips to Memphis to visit the museum in middle school, so it was a bit surreal coming back as an educator this time around,” said Jonathan Elliott, assistant director for club and intramural sports for University Recreation. “I think it’s important to expose and teach students as much as we can regarding equality and advocacy. I think at times we forget that obtaining voting and civil rights is barely 50 years old,” said Elliott. In addition to being able to experience the museum, the students were also treated to a Memphis Grizzlies vs. New Orleans Pelicans basketball game at the FedEx Forum. “This trip was such an amazing opportunity for our students, not only because they were able to experience such important history and culture at the museum, but also because they were able to experience a professional basketball game, a few of which had never done that before,” said Meagan Purdy, graduate assistant for student staff development for University Recreation. “Many of our student staff at University Recreation have aspirations to join the sports business world. This trip gave them the opportunity to visit and experience a professional sports arena and setting which is important for their personal and professional development,” said Purdy. For more information on the services and programs provided by University Recreation visit urec.uark.edu or call 479-575-4646. For more information on the Center for Multicultural and Diversity Education contact 479-575-8405 or uamc@uark.edu.